Well I think you can tell by the reception that your former governor just received how highly regarded you are, Tom, for the work that you did here in Iowa and I would add for the work that you are now doing around the country. Talk about somebody who studies a problem, asks for advice about what will work, puts together teams, collaborates, and then delivers: he is exhibit A. And I want to thank all of you for being here and President Denson and everyone at DMACC. Thank you for once again welcoming me here. I think this is my third visit. The first one back in ’93 or so about healthcare, and then back in ’07-’08. And it’s great to be here with you, alongside my friend Tom Vilsack — a champion for farmers and families here in Iowa and across America. And what I’m about to talk about, the agenda that I am putting forth for rural America, is very much in line with what Tom did here in Iowa and what he is doing at the Department of Agriculture. And I am honored to have his friendship and his support in this campaign. Tom and I just had the chance to see just some of the impressive work being done here to train the next generation of farmers, innovators, tool-and-die makers, machinists, you name it: leaders for rural Iowa. I wanted to come to DMACC to offer my ideas about what we can do to improve the rural economy. And as Tom said, I know it’s a little unusual for a presidential candidate perhaps to be making a speech like this at a community college, instead of in front of a barn or a bale of hay — but we did get a tractor, so at least we’re in the theme here. But I wanted to emphasize the changing face of rural Iowa and rural America: Education. Innovation. Technology. 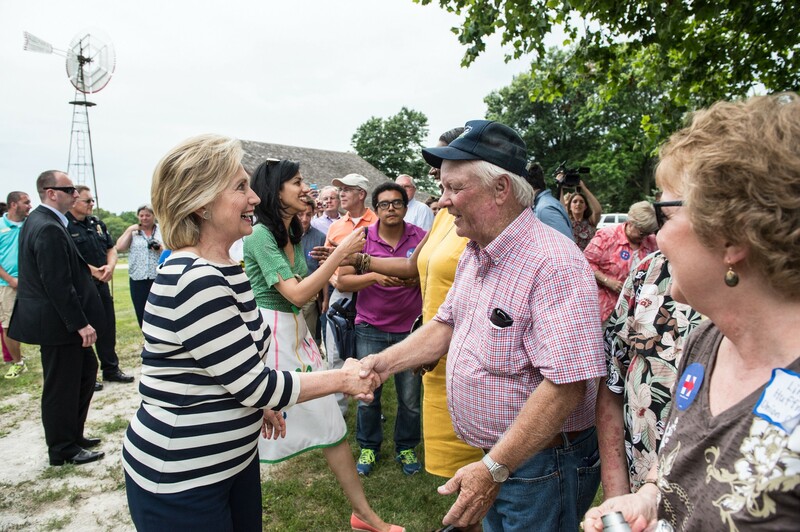 Iowans are in the future business — that’s what all Americans should be in. Just look at the way that you have seized the opportunities from wind energy to biofuels. Think about talking to a farmer who is as attuned to fluctuations in foreign markets as any Wall Street trader. Or spend a few minutes meeting with the students here at DMACC, like Tom and I just did — they are full of energy and ideas and excitement about what their training and education here will mean for them in the future. I want America to be in the future business too. And I believe a strong America depends on strong rural communities. 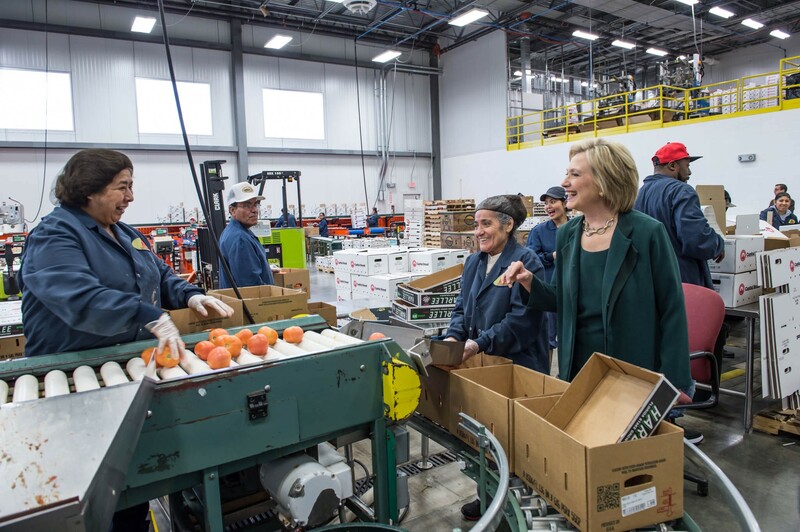 For prosperity to be real and lasting, it has to take root right here in Iowa and in small towns and in rural areas across the country. But I was struck then by the disconnect between upstate, rural New York, which is struggling as it has for years, and the downstate, urban communities. There were entrepreneurs Upstate who were desperate for capital, and there were investors in New York City looking for promising projects — but they didn’t know each other and they didn’t connect with each other. There were even chefs and restaurant owners in Manhattan obsessed with local produce, and there were farmers and wine-makers in Upstate New York who had never sold beyond their own immediate communities. So I got to work. I wanted to convene and connect and we launched something I called the Farm-to-Fork initiative. And we fought for broadband access, and we brought new technology partnerships to rural areas, and we helped to start small businesses get online and find customers all over the world. There was so much potential, we just had to unleash it. And in the years since, the opportunities for rural economic growth across America have only grown more exciting. But the challenges facing rural communities have also grown. Thanks to a lot of hard work and sacrifice, we’ve come back from the worst of the great recession. We’re standing again, but we’re not yet running the way America should. Median household income in rural areas is still thousands of dollars less than in urban communities. Farmland values, agricultural exports, commodity prices have all declined and recently, they’ve declined even as the cost of everything else — like prescription drugs and going to college — keeps rising. More than 25 percent of children in rural America are growing up in poverty. And in many places, you might have to drive for hours to find a quality, affordable health care provider. And too many young people feel they have to move away to find a good job and start a family. Now the consequences of all these pressures on families can be devastating. As I’ve traveled around Iowa, I’ve heard story after story about the quiet epidemic that Tom mentioned — roughly 23 million Americans suffer from and need treatment for addiction and substance abuse, including meth and prescription drugs, heroin, and alcohol. In 2013, more Americans died from overdoses than car crashes. Problems many people used to associate with big cities are now part of daily life in small towns. And there are far too few treatment options available, and there are too fewer because of Governor Branstad’s veto of funding. And here’s a statistic that stopped me cold when I first heard it: Many American women in rural communities — especially those with the least education and the lowest incomes — are actually living shorter lives than American women used to in the same environments. Shorter lives too than women in nearly every other major industrialized country. I’ve looked into this and there is no single explanation, but many of the declines in life expectancy are coming in rural communities are related to job losses, poverty, high rates of smoking, obesity, and substance abuse. Places where the traditional support systems of family and community that used to hold people up are fraying and failing. Women — and men also — who are trying to build a life and a family in such places don’t just face ceilings on their aspirations and opportunities. For many it’s as if the floor has collapsed beneath them. Today happens to be Women’s Equality Day. We have to ask ourselves — or at least I’m asking: How can this be happening in the richest, most powerful nation on earth? So there are many reasons why I believe it’s imperative that we have a comprehensive agenda to revitalize rural America. Today, I’m calling for action in four areas that reflect the greatest opportunities for growth: energy, investment, agriculture, and access to health care and education. First, we need to capitalize on rural America’s strength as a producer of clean, renewable energy. Half a billion solar panels within four years and enough energy production from renewables to power every home in America within 10 years. That will create jobs, it will grow our economy — it will especially grow the rural economy, and it will help us meet the challenge of climate change — which poses an acute threat to everyone, but particularly the livelihood of farm communities through droughts and other extreme weather. But it’s only going to be possible if rural states like Iowa lead the way. Already you’re producing roughly a third of your total electricity from renewables, especially wind and biofuels. If Iowa can do it — I say this all over the country — so can the rest of the America. 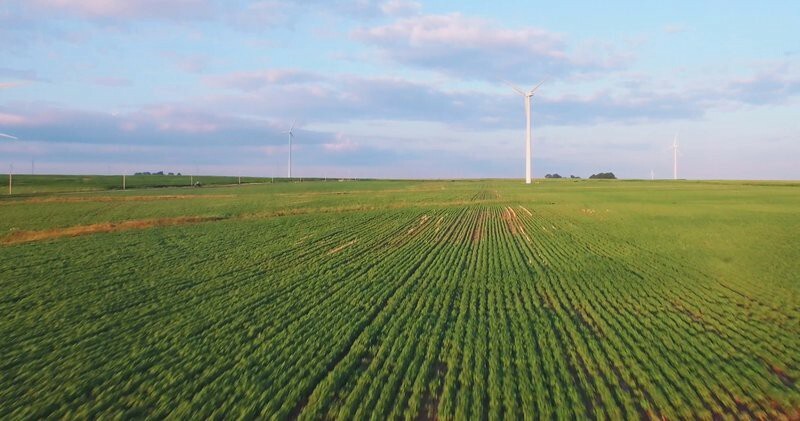 We need to strengthen the Renewable Fuel Standard so that it drives the development of advanced biofuels and expands the overall contribution that renewable fuels make to our national fuel supply. And we should also double our investment in loan guarantee programs that help rural communities build the processing plants and convert agriculture and landfill waste into useful products. Projects like that are already supporting millions of good jobs, and with the right incentives, they can create even more. As we were going through the machine shop and meeting some of the young people, Tom told me one of those Vilsack facts — everybody who knows him knows he has a head full of really interesting facts. Every wind turbine requires 8,800 parts. Just making the parts, like we saw in the classroom, would employ a lot of people. In fact President Denson told me he got 135 calls from businesses in the area wanting to hire tool-and-die makers. And you graduated how many, President? And they graduated thirty. There are good jobs out there. There are good opportunities out there. We just have to do more to connect up, not just young people — but I saw a couple people who had been laid off or whose business was no longer in operation, coming back to DMACC to improve their skills — so people of all ages. Second, beyond renewables, we need to spur broader investment in our rural economy. The vast majority of the 46 million Americans who live in rural America don’t actually farm themselves. And many who do farm rely on second jobs and outside income to make ends meet. 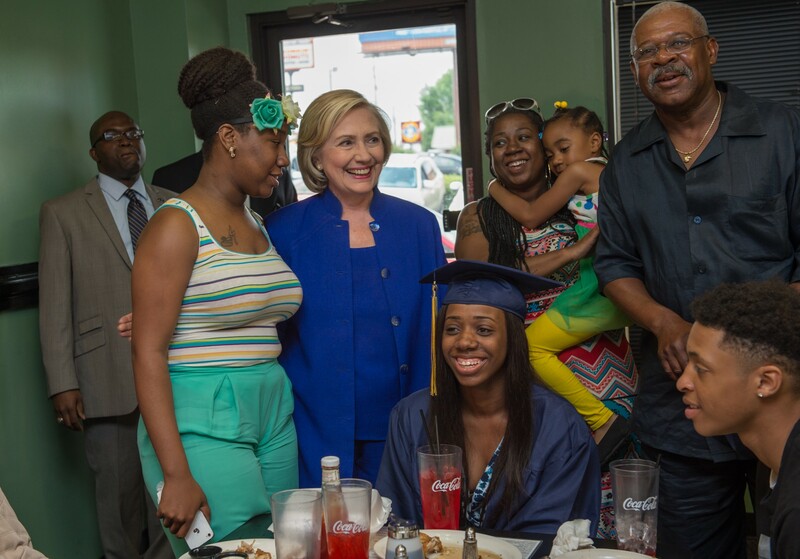 So it’s essential that we create more jobs with higher wages in a wider range of industries. Small and medium sized businesses are the job engines we need. But too often, here in Iowa and in other rural areas around the country, people can’t get access to credit– especially women and minority-owned businesses cannot get access to credit. Why is it so easy for a big corporation to get a tax break and so hard for a small business to get a loan? You know the answer. Well we’re going to fix that. What I want do is to be the small business President, and that includes, small businesses, farms, and everybody who’s actually creating the most jobs for Americans in this economy. And I’m not just saying it. Here’s what I want to do to make it happen. I want to expand on the number of approved Rural Business Investment Companies that link entrepreneurs to capital. I’ll make it easier for community banks that are at the heart of the rural economy to give out responsible loans to small businesses. And for rural businesses to thrive, we need better infrastructure… the roads, the rails, bridges, airports. They all have to be maintained, they have to be brought up to a higher level of performance, and that way they can get products more quickly and effectively to market. And broadband is key to this. Because if we don’t have universal access to fast, affordable broadband, a lot of opportunities are going to be left behind. So I will create as well a national infrastructure bank. We will put special focus on expanding high-speed Internet to connect rural areas to the global economy. I did that in New York. There were a lot of small businesses — they didn’t have websites, this was back in 2001, -2, -3, -4. I brought in a team of people. I partnered with eBay and other technology firms to help small businesses get on to the World Wide Web so they could begin selling more than 20, 30 miles from where they were located. And we began to see results. That’s what I want to do in rural America. I am also a big believer in the New Market Tax Credit, which, was on the books, it encouraged investment in hard-hit and remote communities, and it helped to create tens of thousands of jobs in rural America. We should revive this credit — started by my husband, we should expand it, we should make it permanent. And even as we diversify our rural economy, we can’t forget that agriculture will always be a cornerstone of prosperity. And this is the third area where we need decisive action. We have to stand with our farmers, give them the tools and support they need to boost both production and profits. Whether they’re taking over a long-time family operation or whether they’re new to the industry. In too many ways, the deck is still stacked against small farms. As President, I’ll make sure that federal resources like disaster assistance and crop insurance go to farmers and ranchers who need it the most — not those who have the biggest businesses or the best connections. We will change the formula. Our success with our New York project, Farm-to-Fork, is a model I’d like to scale up and share across the country, so more producers can break into new markets and more customers — especially children — get access to fresh and healthy food. Those new markets might be across the state, they might be across the country — and maybe even across the world. And we need to be smart about trade. Done right, it can drive a lot of economic growth, particularly for farmers who export produce and other products overseas. But we’ve also seen too many hard-working communities hammered by outsourcing and unfair competition. So we need to set a high bar for trade agreements. We should support them if they create jobs, raise wages, and advance our national security. The fourth area where we’re going to take action is expanding access to health care and education in rural areas. That is the key to strong families and strong futures. This community college is a model of the kind of excellent education that should be available to everyone — so our young people don’t have to leave places they love in order to get the skills they need. I support President Obama’s proposal to make community college tuition-free as part of — I think this community college serves 37,000 students. Think about that, that’s a very big opportunity. I want free community colleges to be part of what I’m going to be doing, and they are — my comprehensive New College Compact. It will ensure that cost will no longer be a barrier and debt won’t hold anyone back. Because we are going to offer refinancing of all the student debt that is out there already. And we are going to do is make sure that nobody has to borrow tuition money to go to a public college. So we are really going to go right at this problem that is bedeviling families and students. I also believe we have to start early, so all our kids have the best start in life. Children in rural areas disproportionately lack access to quality, affordable childcare and pre-kindergarten programs. 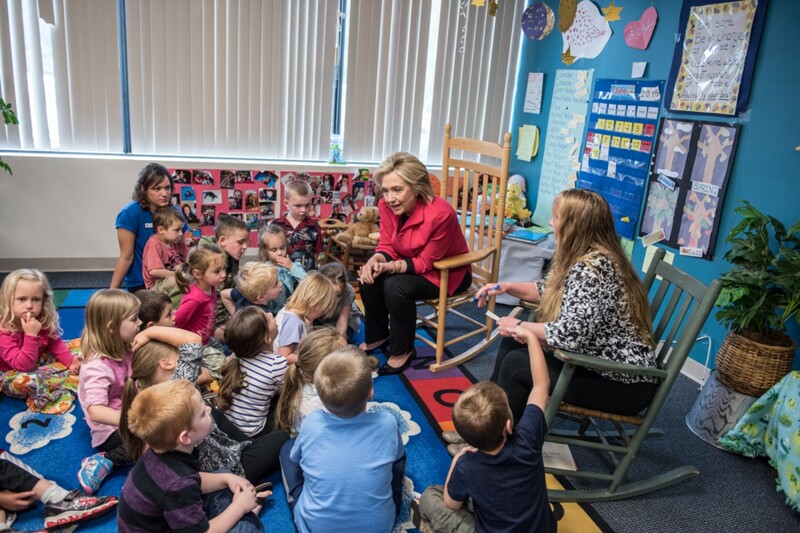 I will double funding for Early Head Start, a program I helped to create when I was First Lady, and set a course to ensure that every 4-year old in America can attend high-quality preschool in the next 10 years. And we also need to do better on health care. Decades ago, I led a commission on rural health in Arkansas that worked on increasing access in remote parts of the state. Today, our health care system has changed dramatically, but it’s still too difficult for families in rural America to find quality, affordable health care. And I know many families here in Iowa are worried about even more rural hospitals closing. Telemedicine can help — and we should streamline licensing and explore how to make that reimbursable under Medicare. Here in Iowa, you just won an important victory, stopping efforts to prevent Planned Parenthood from providing telemedicine services to women who might not be able to make it to a larger city. Thousands of women in Iowa have used these services in recent years. This shouldn’t have to be said, but how can anyone be advocating for denying women access to healthcare? That may be good politics in a Republican primary, but it is terrible policy in the real world. It’s wrong and it should stop. And it’s just one example of the hypocrisy we see from Republican candidates and leaders. They pay lip service to rural America every chance they get. But their out-of-touch, out-of-date policies would strip away the progress we’ve made and take rural communities backwards. They would give billions of taxpayer dollars to big oil companies that are already successful, instead of investing in the clean renewable energy of tomorrow. You know many Republicans even deny that climate change exists, despite the damage it’s doing to farmers and ranchers. And they killed the Export-Import Bank even though it helps small businesses and farmers. Instead of expanding support for education, your governor here in Iowa vetoed additional funding for education. We need to be giving teachers a raise, not putting their jobs at risk. And then there’s immigration. The fact is, American agriculture is heavily dependent on immigrant labor, from the orchards of California to the processing plants of Iowa to the groves of Florida. The Des Moines Register recently noted that even though producers have raised pay, it’s getting harder to find enough workers to harvest their crops. We’re talking about billions of dollars in income lost because of farm worker shortages. Comprehensive immigration reform would help address this problem and give a needed boost to rural communities. And yet many Republicans still say they want to deport millions of hard-working people — breaking up families, disrupting communities, and harming our economy. Now don’t get distracted by the flamboyant front-runner. Most of the other Republican candidates are just Trump without the pizazz — or the hair. Just like him, they don’t support a real path to citizenship. When they talk about “legal status,” that’s code for “second class status.” Now some are even calling for repealing the 14th Amendment to the Constitution and stripping lawful American citizens of their rights. It’s hard to imagine being more out-of-touch or out-of-date. But all the over-the-top rhetoric does throw the choice in this election into stark relief. Voters are going to look for who best understands the pressures facing our families and the challenges facing our nation… who has the right vision for America’s future — and the skill and tenacity to lead us there. Other candidates may be out fighting for a particular ideology, but I’m fighting for you. I’m running for President to deliver real results for hard-working American families so they when you do your part, you can get ahead and stay ahead. That’s the basic bargain of America. In small towns and big cities; young, old, black, white, Latino; our country should work for you and every American… for the struggling, the striving, and the successful… for the farmer who’s up before dawn and never quits… for the migrant worker who labors in the shadow of deportation… for the engineer building a wind turbine to power our future… for the young person who wants to stay in town and keep the family business going. For everyone who’s ever been knocked down, but refused to be knocked out. That’s the America that we are going to build together, and it will include rural America. That is my pledge to all of you. Thank you very much. 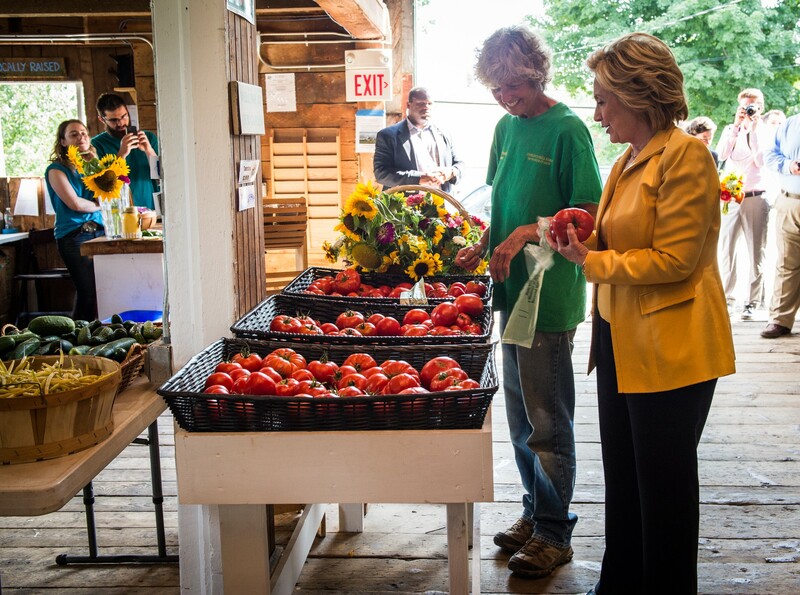 Learn more about Hillary’s plan for a vibrant rural America.